This Summer has been full of a surprising amount of adventures. I got to play a yoga festival with my band! Which included getting free Thai massage, eating two bags of this granola, reading tarot for 4 friends whilst squished together in a little tent and floating in the river for two whole afternoons. I've also done a few just-for-fun photoshoots with friends as models... which might have included some trespassing (how else do you get good locations amiright?). But admittedly when my model and I got chased off of a big farm property by a collie I definitely second-guessed that line of logic. Last but not least I agreed to go to Burning Man as a photographer for an artist who is installing a shrine there (!!!). When life give you lemons build an air conditioned wigwam in the desert... right?! On top of photo duties I'll be helping with cooking food and making snacks for our 8 person crew. I have so many things I want bring! Adaptogenic hawaij! Cacao nib date reishi bars! Buckets of tahini! So much Ras al Hanout! I've been spending a lot of time figuring out just how I (and my chef co-pilot Erin) will be providing legit meals for our peeps without access to refrigeration for 7 days (altho the crew is there for 13 days technically). It's quite the logistical puzzle. We have extraordinarily long lists of meals ideas (including la Playa pad thai, mega breakfast burritos and a chia pudding bar). I can't wait to share all about it! In other news, I crushed the first two seasons of Twin Peaks and am now officially allowed to be in the club where you say pretentious things like "Twin Peaks? It's really about the disturbing complicity we all share in the destruction of the most vulnerable, broken people in society. The transcendental trippiness comes with the territory." Ideally whilst sipping a cold brew coffee and staring off into the distance. I actually found the whole series fascinating not just because of 90's nostalgia. But because David Lynch's directorial choices were so out-of-the-box that everything felt freakishly fresh. Also there are a lot of close up shots of doughnuts and pie and coffee and you know I love that ish. In the mean time, I've been having on-again-off-again allergy spurts. So this morning -- after a sneezing fit -- I decided to whip up this lemon tonic for a bit of a boost. I'm calling it mermaid lemonade mostly because the rhyme and cadence sounds wonderful. Say it 5 times fast. See? Also it does indeed contain some blue green algae, which I'm pretty sure constitute at least 25% of mermaids' diets. That would explain their svelte figures and lustrous locks, right? This mermaid lemonade tonic sipper is really very simple (file that under "reasons it's wonderful!"). It's whole lemon blended with water, greens powder, matcha, blue spirulina (for color) and raw honey. And it's an alkaline storm of goodness. Whole lemon including the zest provides potent Vitamin C, stimulates digestion and flushes the liver. A greens blend provides minerals, vitamins and protein (and plenty of other good stuff depending on your blend). Matcha offers a touch of caffeine and theanine for a steady, zen focus. Raw honey is anti-bacterial, anti-fungal, allergy-improving and even has antioxidants. It's very tart and mildly sweet. In fact it's most similar to a matcha lemonade; that green tea flavor comes through a bit. The acid from the lemon cuts through any bitterness from the greens. And honey helps the flavors to meld together. If you prefer your sips on the sweeter side I would add more water to dilute the acidity and add more honey to taste. I've been using this greens powder called Organic Daily Greensthat I buy in bulk at Wegmans (which is a grocery chain common on the east coast fyi). It is seriously incredible. And crazy affordable when you compare the price ounce for ounce to other super greens powders. It contains nettles, kale, spinach, dandelion greens, collards, barley grass, alfalfa grass, wheat grass, oat grass, spirulina, chlorella, blue green algae, nopal cactus, maqui berry, acai berry, papaya and pineapple enzymes and stevia. I mean hot damn. Thats a powerful blend! The inclusion of nettles in that mix was really what cinched it for me. I'm always trying to get more nettles in my life because nettles have been used to treat hay-fever for eons, and are well documented as an allergy remedy. They're also a fantastic source of nutrition, including vital minerals. Ever since I started seeing a functional medicine doctor back in April I've been trying to stay more on top of my mineral intake. Which means (you guessed it) being more conscientious about getting lots of green foods into my daily diet. Green foods are full of essential minerals that are critical for whole body health. When you're deficient all sorts of stuff goes haywire. I've always absolutely loved green foods (as a kid I would ignore the cake at birthday parties and hang around the raw broccoli plate WHAT A WEIRDO). But even as a veggie lover I find it challenging to work whole green foods into my busy life. Which is really ridiculous since I work from home and have no excuse! If I find it challenging I think it's pretty safe to say everyone else does too. Cue investing in greens powders! I didn't have to look far because Wegmans is basically in my backyard. As I said, that Daily Greens blend is amazing. 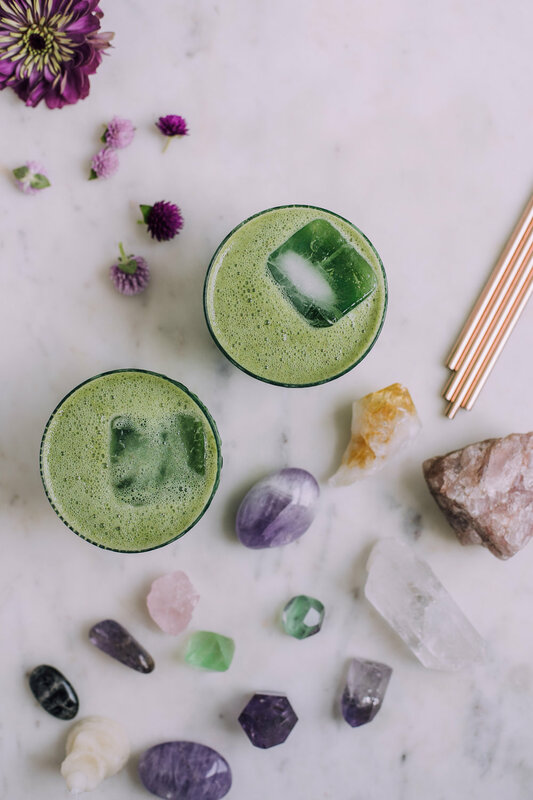 But here are some other similar greens blends I would recommend: Beauty Chef Cleanse Inner Beauty Powder, The Super Elixir , and Sun Potion Green Adaptogen Powder. Or go a simpler route with single ingredient greens like Mountain Rose Herbs Nettle Powder. Or if allergies aren't a factor, go for Spinach Powder. Your greens powder doesn't have to have a fancy name or crazy price tag to be effective. Oh and p.s. I would highly suggest trying this out with 1 inch of ginger blended in. I think it would be absolutely fantastic. But I haven't tested it that way so I'll leave that up to you guys. Note: this is a very tart drink. If you want it less tart, add more water and sweeten to taste. Wash your lemon to remove any wax on the outside. Slice in half and add the lemon to the bowl of your high speed blender. Add the water. Blend on low to start, gradually amping up the speed to emulsify the lemon. Blend about 15-30 seconds, until the lemon is completely liquified. Set a fine mesh strainer over a medium/large bowl. Pour the lemon juice over the strainer, using a spoon to press all of the juice through the mesh. Scrape extra juice and foam from the bottom of the strainer into the bowl as needed. Discard the pulp. Pour the strained lemon juice back into your blender. Add the greens powder, matcha, raw honey, blue magik spirulina and ice. Blend until frothy and smooth. Taste and adjust: if it's too tart for you (and it\'s meant to be quite tart) add more honey to sweeten and more water to dilute to your liking. Blend again as needed. Serve over ice. Pop a straw into your glasses and enjoy!